They come in D's, T's, E's, and A's. The A's and D's cost 53 dollars. But the other materials such as the E's and T's cost 55 dollars, because of the material costs. 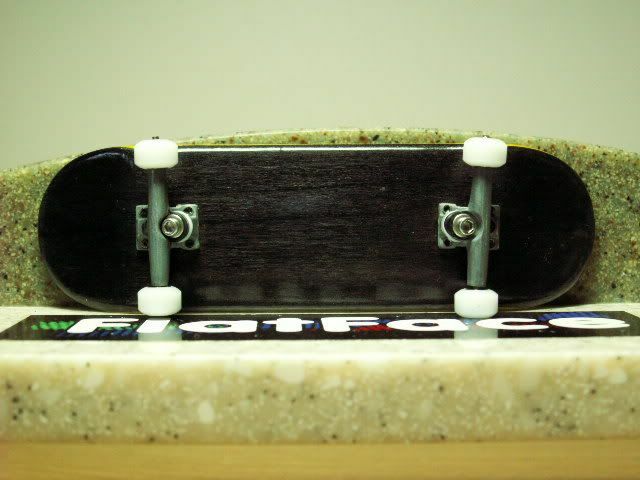 The shape is alot different than the normal flatface shape. This is the D material and they come in many different colors, but these are a nice white color. The wheel tapers off nicely on each side. Wheels are symmetrical and there are no dents or scratches from machining them. The bearings are flush, and are snug inside of the wheel material. At first, I noticed there was a clicking noise within the wheel. I thought it might be a defective bearing. But, there was actually nothing wrong. There is a break in process. After about an hour of using them, they became sooooo smooth. They are literally the smoothest wheels. They dont pick up dust, but i keep my riding surfaces clean. Ive tried G7a's but these are so much better. The material is hard, so if you like harder materials, get these. It is a big investment to make, but trust me. In the long run you will be happy you bought these. So go to www.flatfacefingerboards.com and get your set now! the 7.1's are really good wheels. i still have my g7.1d's and they roll super smooth. great review.